We have been officially informed by the P.M.G. that when the existing stocks of Union stamps overprinted ‘Official/Offisieel’ are used up no more will be made. These stamps were originally made for the use of Government Departments on letters going outside the Union. 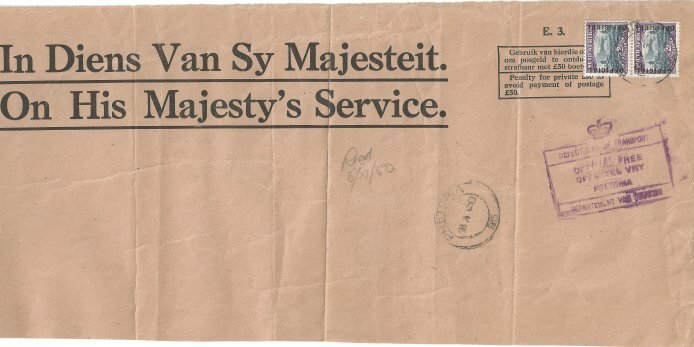 It was at the request of philatelists that they were made available also for the public, although they had to be pur-chased through Pretoria only. Philatelists have gradually come to the conclusion that they amounted practically to a duplication of Union stamps and that they could well be abolished altogether. A request to this effect was forwarded to the P.M.G. from the Durban Congress last year. Hence the decision ‘away with them ‘Few, if any, will mourn their decease. The official bulletin received from the Publicity Officer, Post Office Publicity Branch, G.P.O., Pretoria. It has been decided that postage stamps for use by government departments on official correspondence and issued by the Postal Administration of the Union of South Africa will no longer be overprinted with the words ‘Official - Offisieel’. Existing stocks of the overprinted stamps will continue to be sold until they have been exhausted. The words ‘Official - Offisieel’ have not been overprinted on any of the denominations of the third definitive (Animal) series. 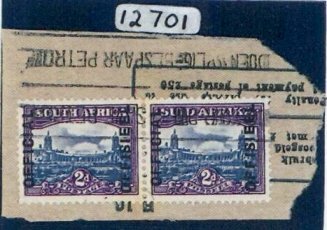 A brief summary of events - 1951 The South African Philatelist - The first a small format 2d overprinted OFFICIAL with a UHB Type II overprint was reported in the January issue, followed by another comment in December and then more of it in June 1952. The 1952 Union handbook listed it as 096a 2d Small size Cylinder 6927/50 - Overprint Type II 16½mm reading up. Item ‘096a’ has been left undisturbed as no information has been made available, as yet, concerning its identity. A small quantity of the 2d stamps in the reduced size was overprinted clandestinely, but as it was not a legitimate emission, it is not listed here. An in depth account of SG 035 January 1951 S.A.P. New ‘Officials’ - Mr. Robertson also furnishes the interesting information that prior to the use of the new process block - a stereotype - for the current 2d ‘Officials’, about a dozen or so sheets were overprinted from the old forme previously employed for 1½d ‘Officials’. These, it was subsequently learned, were part of a consignment requisitioned by the Department of Transport and in the normal course of events were used up on official business. The first knowledge of the matter came from overseas when a used specimen was sent back with an enquiry as to when they were issued and the answer is contained in these notes. As far as is known there are no mint copies and quite probably not many of the used variety. As recorded in our January ‘Notes’ of this year, some of these stamps turned up on mail matter addressed to England and following enquiries into their origin it was learned that several sheets of the ‘Small’ 2d stamps had been overprinted for official use from the old forme instead of from the new stereotype process blocks which had been prepared for the ‘Officials’. They had subsequently been used up by one of the Government Departments in Pretoria in the normal course of official business and there is no record of any mint copies being in existence. Mr Sherwood mentions in his letter that the copy in his possession, which we illustrate here, was discovered in England by Mr H.J. Burkin. Small 2d ‘Official’- Overprint Variety - Following the note and illustration in our December 1951 issue of a single Small 2d ‘Official’ bearing the old type of overprint, we received a letter from Mr. H.J. Burkin, England, enclosing a photograph of a used vertical pair of these stamps, which we reproduce herewith. Mint or used - Horizontal or vertical pairs or singles and if the latter, which language. If on cover, Postmark - Source of origin - with a view to ascertaining the distribution, Mr. Sherwood’s conclusions will be published in due course so that the information he may obtain will be available to all. Small 2d -‘Official’ - Overprint Variety - Further to our Notes of December 1951 and June 1952, wherein the advent of the above stamp was reported, and an appeal for assistance in determining it was made, our attention has been drawn to an overseas offer for sale of a mint pair at £22 (twenty two pounds). 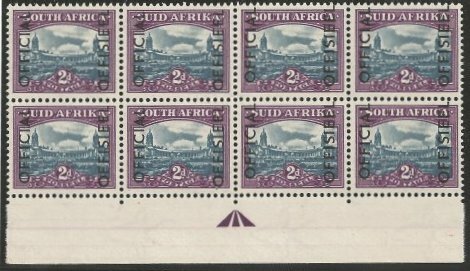 This stamp is catalogued by Gibbons as 035 but un-priced and by the Union Handbook as 096a and priced at 5/- a used pair. When the appearance of this stamp was reported from overseas, and upon enquiring into its origin, we were informed that several sheets of the ‘small’ 2d stamps had been overprinted for official use from the old forme instead of from the stereotype process blocks which had been prepared for the ‘Officials’; that they had subsequently been used up by one of the Government Departments in Pretoria in the normal course of official business, and there is no record of any mint copies being in existence. To our knowledge, no copies, except those which were received on loan from overseas, have been viewed by collectors in South Africa, nor are any housed in collections in this country. It would be very interesting to receive further information concerning the origin of this stamp. 1960 London Exhibition - During 1984, Alan Leverton of Bridger & Kay informed that a full sheet of SG 035 was jointly purchased by his Company and Stanley Gibbons. Eric Sherwood remained completely convinced that 035’s are 100% genuine and I agree with his sentiment. Who would carry out a clandestine overprint that was to be used on official overseas mail, the remnants of which ended up, either in a bin or became part of cheap kiloware? Used examples whether single or pairs, either vertical or horizontal, are and will always be great rarities. In some thirty five years of trading I have had the privilege of handling one used horizontal pair on part of an OHMS envelope, at the time I had five people on a wants list who where all desperate to own a used pair. During the late 1980’s at a London Stampex Exhibition, I recall the late Alec Page showing me a commercial envelope with a 035 on it; unfortunately I cannot recall whether it was a single or a vertical pair, someone somewhere must be the proud owner of it. I find it difficult to understand that the doyens of Union philately could be so short sighted by completely ousting its listing in the Union handbook. 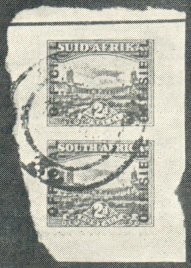 It seemed to be the attitude, that unless these stamps resided in South Africa, they were obviously fakes or attached to some suspicious circumstance. 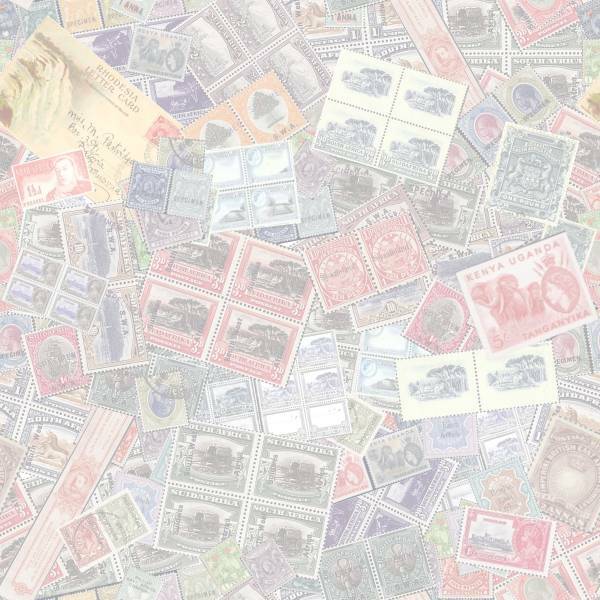 London has always been the stamp capital of the world and probably paid better prices for rarities than any other country. No matter from which Commonwealth country an item originated, it invariably ended up with the London stamp trade. In 1951 there was the Festival of Britain and I imagine many South Africans made the trip over. If you had some worthwhile stamps to sell, it presented the perfect solution to fund ones overseas spending money. Mint sheets of 035 had to be printed before they could be used for postage and whilst it was the opinion that no unused examples survived, it may not necessarily be the case. There is of course the possibility that someone could have run off a few extra sheets at a later stage, but is such evidence available for inspection? It seems to me that it maybe the usual philatelic trait; if you can’t explain it, then condemn it. When the hammer fell I had bought it for R190 and afterwards Henk de Lange informed me that he had found it in a club approval book as SG 038 and had paid a few cents for it. Having only been in the Stamp trade for some four years, I never gave my purchase a second glance and returned home to England with my first mint 035. A KGVI collector asked for it on approval and telephoned me a few days later informing me that the overprint was not quite right and I was more than likely in possession of a forgery. Somewhat crestfallen my pair of ‘dud’ officials was returned to me and upon closer examination I realized that on a 035 the ‘O’ in 0FFICIAL/0FFISIEEL needed to be oval instead of circular. Then I compared my dubious pair to a normal SG 038 and could not see any difference between the overprints, the measurements were identical and the type of ink used also matched, could I possibly have an unrecorded inverted overprint? I could feel my eyes developing $ signs, but first there was a matter of verification. My first action was to do as much of my own ‘homework’ as possible and I have recently located my 1983/84 correspondence on the matter that started with a 12 September 1983 longwinded letter to Sotheby’s. In it I debated the issue which concluded that it was either a genuine pair of stamps with a forged overprint or stamps & overprint genuine having discovered a new variety of 038 and suggested it be sent to an expert committee. The auctioneers did not quite grasp what I was on about and their reply, dated 28 September, emphasised that their description stipulated it was an ‘unauthorised official overprint (SG 035)’ and added ‘As far as the illustrations are concerned regarding squashed ‘0’s, I think these could well be misleading. Although it matches up with the type used for the last series of officials I find it strange that in the period from then until now I have not seen any previous reference to such stamps. I also showed this official to Alan Leverton of Bridger & Kay and sought his opinion with a definitive reply that my pair was not 035. 8 December 1983 I submitted an article to the S.A.P. with a heading: - Do We Have a New ‘Official’ Discovery? After that flurry of activity it became a waiting game and I heard nothing further for some seven months, during early July 1984 I was verbally informed by Sotheby that the expert committee had decided both stamps and overprints are genuine, but it required more letters to spur on the P.F.S.A. in returning the pair to me in England. In the meantime I gave the new discovery some publicity and in the October 1984 edition of Stamp Magazine an illustration appeared along with a dozen lines of text under the caption Inverted Overprint. I wrote to Stanley Gibbons and Bridger & Kay requesting they list it in their next catalogue. From the latter firm I received the following comment dated 26 July 1984: ‘I am most interested in the comments regarding the S. Africa 2d Union Building with official overprint. In my opinion, this could either be a proof or part of an unissued printing, but I find it very difficult to understand how such an item has gone for so long undetected if it is, in fact, an issued stamp. My initial price for the first and only known inverted overprint variety of SG 038 was £3000, it was not snapped up immediately and I recall that I sold to a KGVI dealer for around £2700. Unless one is very observant, as this particular variety has demonstrated, it is quite easy to overlook an inverted overprint, my publicity of its existence will have spurred collectors and dealers alike to have a second look at their quantities of mundane and very cheap 2d Officials. It did not take long and pairs, blocks or larger multiples to come out of the woodwork, their owners must have been delighted with their finds. As far as I am aware not one single used copy has come to light. It is not possible to determine how many 2d inverted overprints exist and it has been my opinion from the outset that it ought to be rarer than 035, yet the current catalogue values are oceans apart. There is a very good explanation for the foregoing; there is a space for a 035 in every printed KGVI album, but sadly no home for 045a - thus the demand for a 035 outstrips the other and the price reflects that. Hindsight is wonderful, if I had today’s experience, back in the early 1980’s and came across an inverted overprint on a cheap stamp, I would not publicize it, instead I would advertise a good buying price for the stamp, buy thousands of them and hopefully find several inverts amongst such a holding - all wishful thinking. It comes as no surprise that forged inverted overprints exist on the 2d Union building official and it is not long ago that I received an email asking if I could authenticate a pair. Forgers often make obvious mistakes and in this case the overprint was on the wrong printing. The 2d on UHB Sets 24 & 25 are overprinted on Issue 14 from cylinders 6927/50 with a distinct deep violet shade and I have only seen the inverted overprint on that issue. The forged overprint I was presented with was on a later issue. The only other 2d Stereo official overprint is Set 29, issue 15 using cylinders 30/18.